ShinBit is receiving a Melarsomine injection to kill the adult heartworms. So Melarsomine is an adulticide and is the Immiticide referred to in the heartworm treatment report. Remember the adult worms can live in the heart and pulmonary arteries which is why heartworms get their name. Melarsomine is the only medication currently being used to kill adult heartworms. Because it is injected into the muscles of the back, the injections can be painful. Doxycycline is also used to kill the Wolbachia organism infection that often accompanies heartworm disease. This organism is thought to also provide some sort of protection for adult heartworms and may cause inflammation in the lungs of the infected animal after the adult heartworms die. The dying heartworms can cause obstructions in the blood vessels of the lungs. Exercise can increase the risk of an embolism and serious side effects so ShinBi must be kept quiet and inactive during his heartworm treatment. Treating for heartworms is not just a simple pill. The treatment must kill the microfilariae and the adults. Remember that a dog can have a heartworm infestation and not test positive. A heartworm infestation will only become apparent if there are adult females present because the standard tests looks for microfilariae (baby or the first larval stage of heartworm parasite development). There is currently one drug approved by the FDA for use in dogs for the elimination of adult heartworms. This drug is an organic arsenical compound. Dogs receiving this drug therapy will typically have had a thorough pretreatment evaluation of its condition and will then be hospitalized during the administration of the drug. Melarsomine dihydrochloride (Immiticide®, Merial) has demonstrated a higher level of effectiveness and safety than any other adult heartworm treatment previously available. It is administered by deep intramuscular injection into the lumbar muscles. For complete information on the classification and treatment for heartworm infected dogs using this product, consult your veterinarian. Prior to treating the adult heartworms, your dog will be put on a 4 week course of doxycycline (or a related antibiotic). This helps reduce the viability of the parasite and decreases the reaction to the dying and decaying heartworms following adulticide treatment. The primary post-adulticide complication is the development of severe pulmonary thromboembolism. Pulmonary thromboembolism results from the obstruction of blood flow through pulmonary arteries due to the presence of dead heartworms and lesions in the arteries and capillaries of the lungs. If heartworm adulticide treatment is effective, some degree of pulmonary thromboembolism will occur. When dead worms are numerous and arterial injury is severe, widespread obstruction of arteries can occur. Clinical signs most commonly observed include fever, cough, hemoptysis (blood in the sputum) and potentially sudden death. It is extremely important to not allow exercise in any dog being treated for heartworms. Often dogs with severe infections will also require the administration of anti-inflammatory doses of corticosteroids. The most effective drugs for this purpose are the macrocyclic lactone (ML) anthelmintics, i.e.,milbemycin oxime, selamectin, moxidectin and ivermectin. These drugs are the active ingredients in commonly used heartworm preventives. Although their usage as microfilaricides has not been approved by the FDA, they are widely used by veterinarians as there are no approved microfilaricidal drugs currently available. It is recommended that microfilariae positive dogs being treated with these macrocyclic lactones be hospitalized for at least eight hours following treatment for observation of possible adverse reactions, including those resulting from rapid death of the microfilariae. Circulating microfilariae usually can be eliminated within a few weeks by the administration of the ML-type drugs mentioned above. Today however, the most widely used microfilaricidal treatment is to simply administer ML preventives as usual, and the microfilariae will be cleared slowly over a period of about six to nine months. The goal of adulticide treatment is the elimination of all adult heartworms. However, clinical improvement in dogs treated for heartworm infection is possible without completely eliminating the adult heartworms. Heartworm antigen testing is the most reliable method of confirming the efficacy of adulticide therapy. If all the adult worms have been destroyed or very few survive, heartworm antigen should be undetectable after six months post-adulticide. Dogs that remain antigen positive at that time could be considered a potential candidate for repeat treatment with an adulticide only after a full review of each case. In some cases, an alternative is to not retreat with the arsenical but to continue with a preventive such as ivermectin which will gradually eliminate the remaining worms. According to the Centers for Disease Control and Prevention, Anaplasmosis is a tick-borne diseased caused by a bacterium (Anaplasma phagocytophilum). Anaplasmosis can be transmitted to humans or dogs by tick bites. There are four distinct phases in the tick-life cycle. Typical symptoms include: fever, headache, chills and muscle aches. There are no known cases in the state of California. The highest incident rates are in Delaware, Marine, Minnesota, New Hampshire, New Jersey, New York, Rhode Island, Vermont and Wisconsin in humans. In dogs, according to the VCA Hospitals website, infection can cause lamesness, joint pain and low appetite in dogs. Most dogs show signs in 1 to 7 days. The treatment is the same for other tickborne infections: Doxycycline. Remember, ShinBi was shaved in South Korea due to a tick infestation. 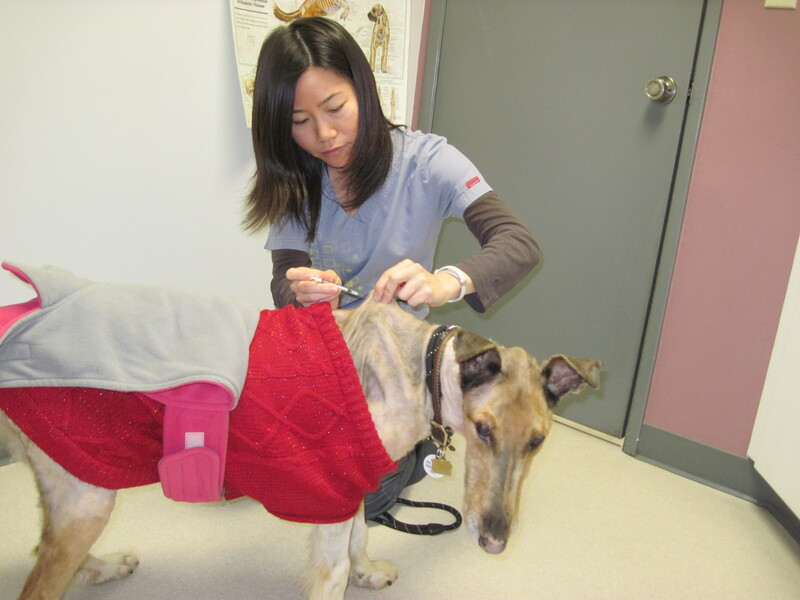 ShinBi is already being treated with Doxycycline for his heartworm condition. He is also being treated with Trifexis for heartworm as well. Doxycycline is an antibiotic used for treatment of a variety of problems. ShinBi is being given this medication for his heartworm. ShinBi was also positive for Anaplasmosis and Doxycycline is also used to treat this–that’s two for one! Doxycycline is a broad spectrum antibiotic that is a member of the tetracycline family. It is used to fight bacterial infections in dogs and cats. Doxycycline is used to treat many different bacterial infections including, leptospirosis, toxoplasmosis, mycoplasma, psittacosis, and tick borne diseases including Lyme disease, ehrlichiosis, and Rocky Mountain spotted fever. Doxycycline binds to specific cell parts (ribosomes) of the bacteria and inhibit the protein synthesis, thus not allowing the bacteria to grow and divide. The process of shutting the protein synthesis down is not rapid. For this reason treatments using Doxycycline are generally termed as a long term treatment. It takes some time after the process is shut down until NSAIDs work by reducing the enzyme COX-2. COX-2. these enzymes are involved in the formation of prostaglandins which cause swellingand inflammation. Reduction of these factors reduce the pain and inflammation your pet experiences. ShinBi received a Dexamethasone injection. ShinBi is being treated with Trifexis. Serious adverse reactions have been reported following concomitant extra-label use of ivermectin with spinosad alone, one of the components of Trifexis chewable tablets. Use with caution in breeding females. The safe use of Trifexis in breeding males has not been evaluated. Use with caution in dogs with pre-existing epilepsy. Puppies less than 14 weeks of age may experience a higher rate of vomiting.